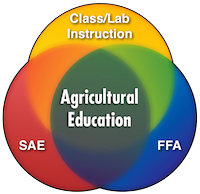 Nebraska agricultural teachers, faculty from higher education, and industry representatives have helped to determine appropriate standards for students enrolled in agricultural education courses. Taking a backwards-approach to development, standards were written with capstone courses that are based on entry level college courses in Nebraska. From there, an intermediate level course was written, and finally the introductory level course. This creates a three-level Program of Study for a student to experience specific career pathways within the Agriculture, Food, and Natural Resources career field. The courses are outlined in the graphic below with the introductory level on the left, intermediate level in the middle, and capstone level courses on the right. Click to download a printable version of the AFNR Programs of Study and Course Standards Outline at the bottom of this page. To view specific standards for each course, click the Visit the Course Standards Portal button. Looking for more resources as you build your curriculum? While not specifically endorsed by the Nebraska Department of Education since Nebraska offers our own set of course-based standards, the National Council for Agricultural Education has developed a comprehensive set of Career Pathway-based standards for Agriculture, Food and Natural Resources. They were revised in 2015 and provide a good source of information, resources and ideas for teachers in addition to Nebraska’s standards.